Sparkling Gamay??? FABULOUS! ... Super lively bubbles and the lightest lemon gold in color, this is soft and saline, with hints of anjou pear on the nose and palate. "Schisty", lovely and clean, this sparkler is somehow creamy and yet ultimately bone dry. C'est Magique! A pleasant herbaceousness resounds, along with subtle citrus and oh so clean and minerally. The subtlest hints of green apple and anise emerge with warmer temperature, while a soft playful mouthfeel persists. What a way to start the New Year! $22.99/btl @Aurora Provisions, Pine St., Portland. 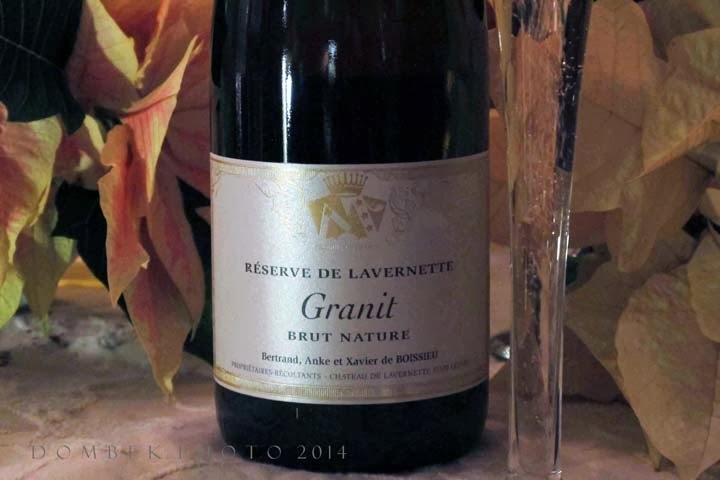 Twelve and thirteen generations of winemakers have passed on their passion for wine and knowledge of terroir at the vineyards of Château de Lavernette. Working both organically and biodynamically, they make high quality wines in the most pure and natural way possible, with ultimate respect for nature and the environment. Located in the region of Burgundy, France, where Macon and Beaujolais intersect, Château de Lavernette is owned by the family de Boissieu, descendants of the family de Lavernette. I was delighted to experience this sparkling wine (blanc de noir) made from a grape usually associated with the still wine Beaujolais. Made in the traditional "méthode Champenois", the grapes are harvested by hand and pressed in whole clusters for the base wine. Yeast & sugar are added for "tirage", then bottled, where it is aged and fermented. No "liqueur de dosage" is added, which is why it is called Brut Nature (Extra Dry Wine), and only the smallest amounts of sulfur dioxide added. This is perfect for any Celebration and may be enjoyed all by itself. However, paired with seafood such as oysters or shellfish would be a delight. The winemakers also recommend fondue, sushi, tempura, soufflé, crepes or quiche, or perhaps simply accompanying a variety of soft cheeses, hard, salty or soft. This wine comes to us from CRUSH Distributors, Portland, ME through VINTAGE '59 Imports, Washington, DC. Also available locally at Browne Trading Co., Commercial St., RSVP, Forest Ave. & Rosemont Market/Munjoy, Portland. In Paris their wines are carried by Cavistes (wine shops), some bistro type. As follows: Le Caviste Bio, Les Domaines qui Montent, La Part des Anges (Bures-sur-Yvetty) and La New Cave. Granit may also be found in cities around the world including Copenhagen, Luxembourg, Tokyo, London, Bruxelles and Amsterdam. Château de Lavernette is a small domaine with small allocations of wines. In France, wine may be ordered directly from them as well.